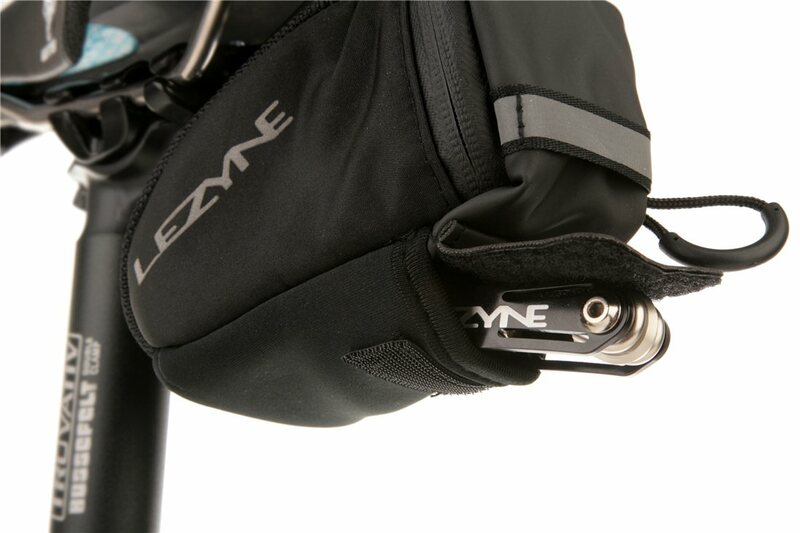 The Lezyne Caddy is perfect for carrying your flat kit, tools, wallet, and any other important small items that you may need on the road. The Caddy is made from durable woven nylon and features a weatherproof zipper to protect your gear from Mother Nature. The Caddy's main compartment features neoprene pockets for organizing things like patch kits and money and an external compartment for quick access to tools. Good saddle bag but even being a medium size it looks small. The product is good. The issue is that it is not large enough to carry basics for MTB. The description seems larger than actual. MTB tube, co2, levers is packed tight. It does have a separate spot for multi tool which is great. If you have shirt pockets you can put your power bar in there. 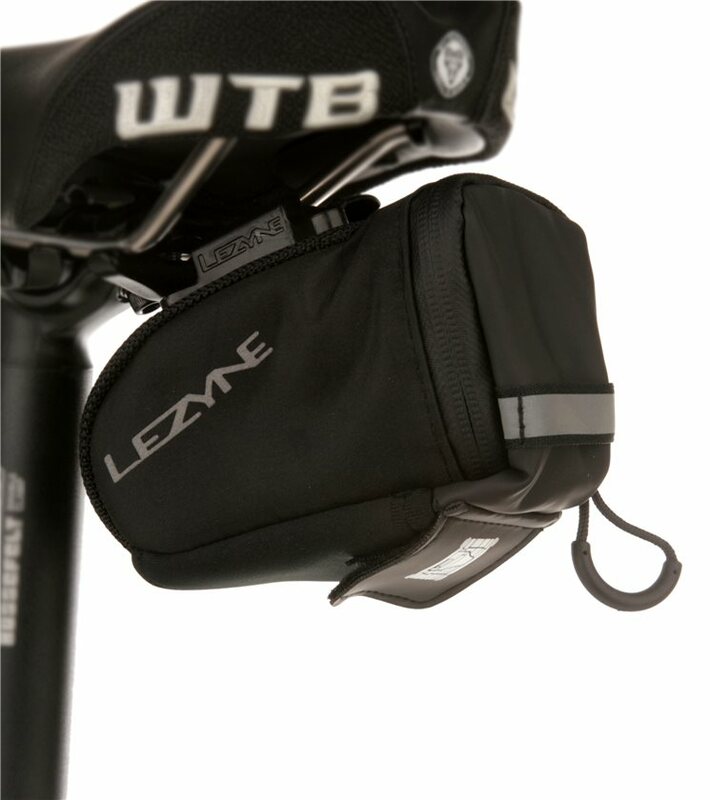 I'm using this saddle bag with my 2014 Giant Trance 1 and its Giant Contact dropper post. It works magnificently. Highly recommended. Perfect size for everything but a spare tube, it's a bit small for that. I've got allen keys, tire levers, a patch kit, cash, medical ID, and a CO2 canister or two in mine. With all that it's not too heavy, never shakes around, and never touches the rear tire. Very secure for road bike, haven't tried it for MTB. Fits one tube, tire levers, 2 CO2 and a small multi tool. Mulit tool pocket is under main compartment. Overall very happy. This works great with dropper post and fits a 27.5 tube. I was looking for a bag that had a convenient attachment method, instead of straps, and this one certainly is what I had in mind. Only downside is that this "medium" is more of a small size, as it will only fit a spare tube and tire levers in the main compartment, and the Lezyne multitool (purchased separately) in the nice compartment underneath. 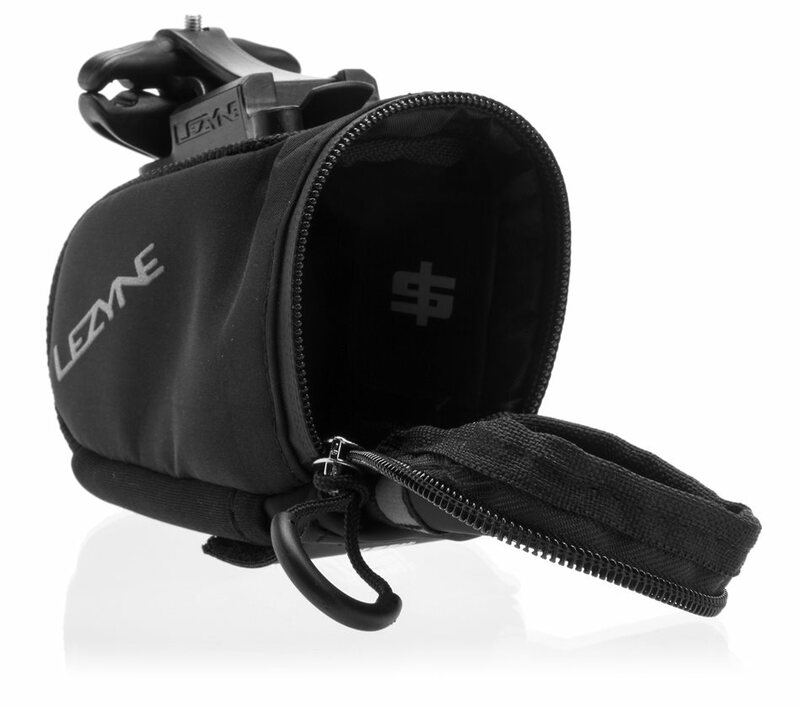 My favorite saddle bag--I have it on all my bikes now. It's so easy to clip in and clip out, and that makes access to tube and tire tools a snap. Much better than velcro straps which loose their tooth and struggling with a zipper on a soft canvas bag. Perfect bag for a road bike, better than any other bag I have had over the years. You can even get extra mounts for additional bikes so no need for additional bags unless you think you might forget to transfer it over. I especially love the fact of no more seat tube strap. Very clean and simple, truly a 5 highly recommendable. The quick release makes it so you can still use dropper seat post. The plastic release wears a bit as ride rougher terrian loosen the QR . I use a rockshox reverb dropper post on my bike. That's a great saddle bag, hard fixed in saddle rails. The bag has passed in my waterproofing tests. Came all the way from California to Indiana very promptly. Came right on time and in perfect condition. 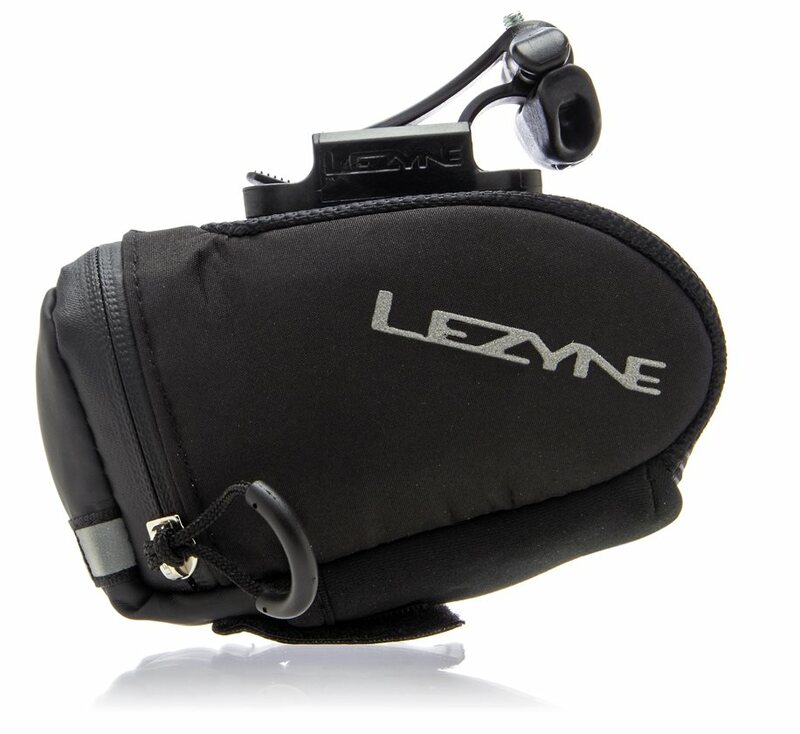 This is a good saddle bag. How robust is the clamping system? Will this handle the rigors of a daily ridden MTB? Will it fit a wallet? BEST ANSWER: If you squeeze in a wallet, it won't have much room for anything else. not including the wallet, it does fit everything else you need for a ride. A, it depends on the wallet. B, if you put in nothing else. C, a license, credit card, insurance card and a few $20’s in a baggy fit just fine. No it will not fit a wallet. The internal dimensions are roughly 2"x2.5"x4.5" while an average wallet is 3.5"x4.5" with varying thicknesses. Not a normal bifold wallet, but definitely as many credit cards as you care to carry. Probably a compact tri-fold wallet too. Yes - several. I have a 29" slime filled spare tube in mine and that almost totally fills it up. It fits my wallet. Mine is a basic fold with room for cash and 8 cards. Yes. It's a tight squeeze, but my bi-fold wallet will fit.